By grace of Gayatri Mata we can reach the peak of any field. 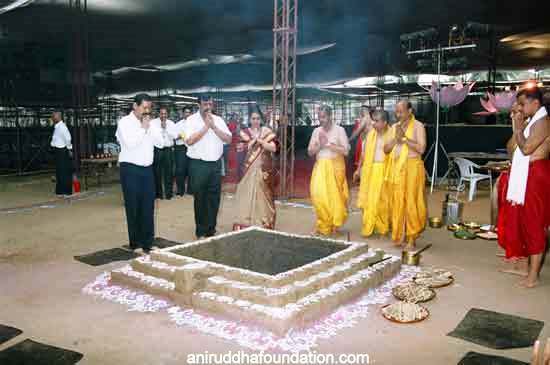 Under the guidance of Sadguru Aniruddha Bapu, ‘The Gayatri Mahotsav (Festival)’ was held from 15 May 2004 to 17 May 2004 at Andheri Sports Complex, Mumbai. 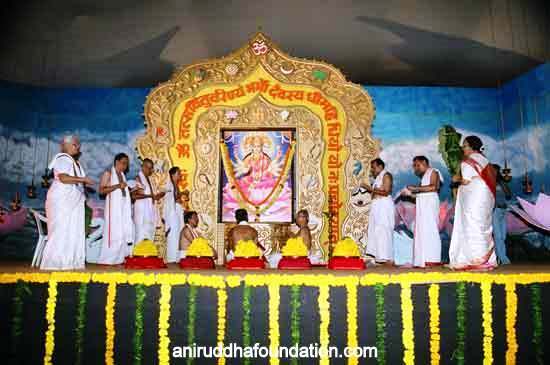 In this festival, the Gayatri Mantra was recitated continuously from 8 am to 7 pm, each day for 37,12,470 times. Lakhs of shraddhavan’s participated in the Purascharan Yaag. 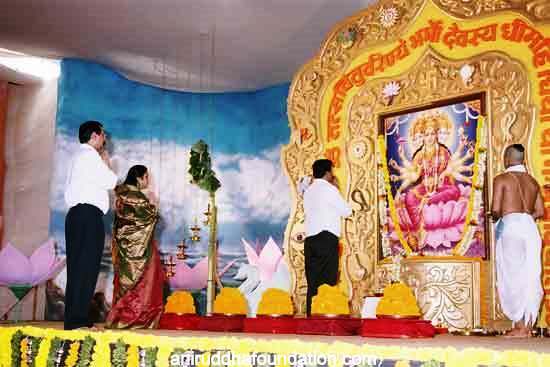 During all the three days of this festival, Sadguru Bapu himself performed Aarti of Gayatri Mata along with Nandai and Suchitdada. Sadguru Aniruddha Bapu explains in his book ‘Matruvatsalyavindanam’, the meaning of Gayatri Mata as “I am God Almighty and this realization of God” is Gayatri Mata. She is the power behind vibrations of the universe and the self-actualizing knowledge. Vedas have addressed her as Gayatri Mata. “I am God Almighty” this consciousness has revealed “Omkar” and his first sound is known as “Parabrahma”. Meaning – We mediate on the God ‘Savitru’ who is beyond the earth, space and heaven created by ‘Pranav’ or ‘Omkar’. Let him motivate our intellect. 2) Chanting Gayatri Mantra, thrice a day and 24 times each after taking bath. 3) Having steady devotion for Gayatri Mata’s son.